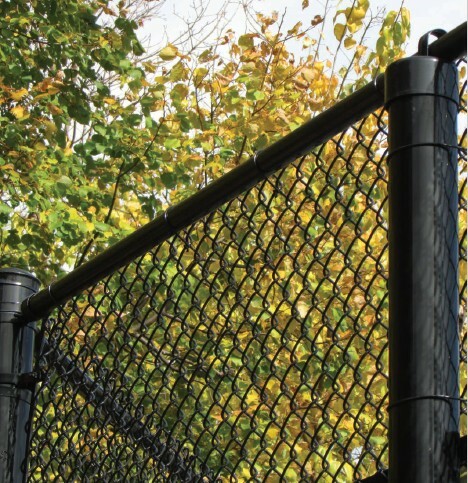 The galvanized steel core wire for producing extruded PVC coated steel chain link fence fabric is produced by cold-drawing good commercial grade steel rod into wire of the appropriate diameter. The steel rod from which the wire is drawn is produced by the open hearth, electric furnace or basic oxygen process. The galvanized coating is produced by passing the cleaned wire through a bath of molten zinc which conforms to ASTM B6. The extruded PVC coating is produced by extruding PVC at a coating thickness of 0.015” (.38mm) – 0.025” (0.64 mm) over a galvanized core wire. Zinc-coated steel framework is thoroughly cleaned during the pre-treatment process, then color coated with a 3 mil minimum polyester layer for protection from corrosion. Fittings are made of galvanized steel with a 3 mil minimum of polymer layer for protection from corrosion.